Order now via our secure ordering facility. We accept Credit Card, Paypal, Bank Transfer & Cheque. Dimensions: 12 inches long by 9 inches wide .Two layers of absorbent terry. Designed to provide absorbent protection for your mobile toddler. So easy to use, your little one will be able put it on. 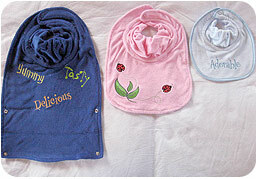 Two layers of soft, absorbent baby terry with fun embroidered words to inspire exploration of new foods. Available in Three “big kid” colors, each embroidered with the same words.